Black sleeveless dress, has mesh material down centre front with skeleton bones printed on. The v shape has eyelets with ribbon. 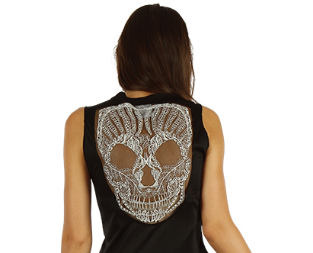 Slightly flared skirt with a lace skull on the back of the dress. Size medium to large – fits up to approx. 96cm bust.